We are designing and directing freshwater wells for public and private water supply including water board authority procedures. Furthermore we are doing well monitoring and inspection based on which we recommend workover, extension or substitute wells. Depending on Geology, room available, energy demand and legal circumstances, Near Surface Geothermal Energy can be extracted from different heat sources (ground water, soil, rock). The heat sources are explored by a ground loop field or a production well to produce water, which is returned to the aquifer after heat extraction. Extracted heat is pumped to a higher temperature level by a heat pump demanding only a fraction of the output energy at low temperature systems. Numerous thermal water wells exist in Austria and in the neighbouring countries, producing thermal ground water for spa and cure application. We have planned, supervised and monitored a number of these wells. 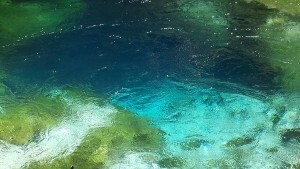 The background picture shows the Blue Eye (Albanian: Syri i kaltër), this is a water spring and natural phenomenon occurring near Muzinë in Vlorë County, Albania. It has a discharge rate of 18400 l/s.